 4M Crystal Mining Kit is a geology game focused on crystals.  Includes clear quartz, rose quartz, dolomite, agate, amethyst.  Magnifier and instruction book provided. 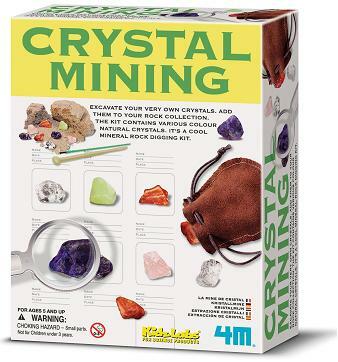 The 4M Crystal Mining Kit (ages 5 and up) is a geology game that focuses on crystals. Children excavate and analyze crystals including clear quartz, rose quartz, dolomite, agate, amethyst. They can also proudly display them using a display box. The game includes plaster rock, a digging tool, a brush and various other tools. Another thing that we like is that it contains a magnifier that children can use to closely analyze the crystals. There is also a book containing instructions. Children gain an interest in geology by excavating and analyzing these crystals using a brush and digging tool. They also learn about the different kinds of crystals.